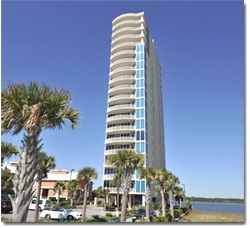 Gulf Shores AL bay-front condo for sale at Lagoon Tower. Luxury at its finest. Serene waterfront living. Private, low-floor, corner 3BR/3BA unit with breathtaking views from every room. Condo features floor to ceiling glass windows offering views for days, tile flooring throughout main areas, granite countertops, all stainless-steel appliances, custom cabinetry, upgrades fixtures, recessed lighting, wet bar with sink and ice maker. Lagoon front master bedroom offers private access to balcony. Relax, unwind and enjoy the gorgeous views. Spa like master bathroom features dual vanity with his/her sinks, jacuzzi tub, separate stand up shower and large walk in closet. Lagoon tower is a low-density complex with secure elevator access, outdoor pool, indoor pool with hot tub, BBQ area, fitness center, first come first serve boat slips, fishing pier and private boardwalk for easy beach access across the street. Prime location in the heart of gulf shores located on beautiful west beach. Just minutes to shopping, restaurants, beaches, festivals and more. Don’t miss your opportunity to own a piece of paradise.